While some people can find dozen of reasons not to run a full marathon which may seem valid, there are few good reasons why it's worth a try. With proper training and preparation, you can make your first marathon experience pleasant and optimal with less body pain and hopefully no injuries. Here are ten reasons on top of my head right now why I am choosing to run my first 42.195km in #SCMS2016 marathon this coming December 4, 2016. Running makes your heart stronger and healthier because it gets bigger and able to pump more. Cardiovascular activity increases the number of new blood vessels, which means more places for blood flow that leads to more efficient circulation. Running also helps lower high blood pressure, improves your blood sugar levels, reduce bad cholesterol and boost LDL "good" cholesterol. When I run my first 5km in 2009, running 10km never slip my mind. But I was wrong, a year after I found myself running my first 10km which was followed by bunch of 10km runs. Flying to Singapore makes it more viral where there are almost 40 running events yearly hosted by the country that means minimum of 3 opportunities to run every month. After running my first 21km in 2015, I gained more confidence that I could eventually run my first full marathon maybe next year. Sure I needed more push, more training and less procrastination. Thanks to Visa running club and Rocky(our trainor) who have always been passionate in training and running. Running a marathon does not begin in the starting line of the actual event. Running a full marathon begun when you first decided in your mind and heart that you will do it. This should be followed by a rigorous training plan, proper nutrition and constant reminding of yourself that you need to get up, put those running shoes on and run. Running 5-10 kilometers never fails to provide me a sound sleep as I allow my muscles and body to recover over night. One of the best reasons why I run and will continue running. Running allows me to indulge in those sinful, decadent, guilty and divine food once in a while without feeling remorse to myself. 8. So I could encourage my kids(in future) for whatever undertaking they'll have. "Sweetheart, sure you can do it, mom did marathon in the past and finish it." Organization like GiveAsia together with marathon events(like Standard Chartered) allows you to select charities that you want to support. I share advocacy with Singapore Red Cross and World Vision, you can check my Run for a Cause page through this link. As this is my first time to run full marathon, I wanted to make a difference by not just finishing the race but dedicating this run to organizations who have big hearts changing the world. 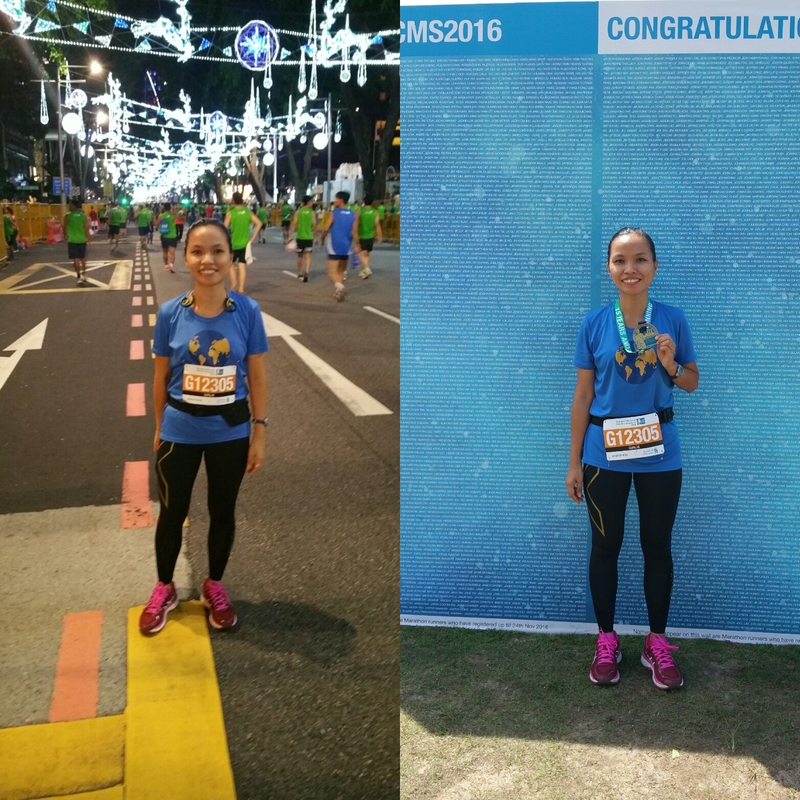 More than just a bucket list moment SCMS2016 is a moment worthwhile for others. A moment of giving back. A moment of change. Hence this is my simple way of restoring humanity. 10. To learn about my body, its capacity and limitations. Training and running for a marathon enabled me to discover strength, endurance and determination I never knew I had before. "Ordinary people know their limits, marathoners push theirs." All praises to God! The author of life and my ultimate source of strength!